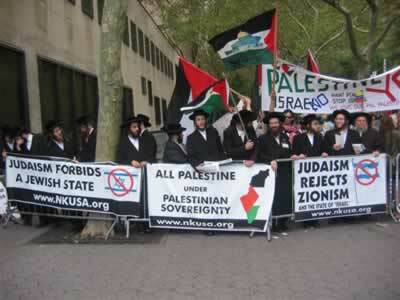 Orthodox Jews gathered outside the United Nations in New York City, NY to express their opposition to the State of “Israel” and Mr. Ariel Sharon, who was speaking in the United Nations. Orthodox Jewish Rabbis and layman will gather, TODAY with G-d’s help, across the street of the United Nation Headquarters. They will join in expressing their opposition to the State of “Israel” and Mr. Ariel Sharon, who will be speaking today in the United Nations. While the United Nations is celebrating its 60th anniversary, they have invited Heads of State of over 150 countries. Participating in this commemoration, is Mr. Sharon as the Head of State of the State of “Israel”. The State of “Israel” has been recognized and legitimized as the representation and embodiment of the Jewish nation; this is patently and totally false. The State of “Israel” is an embodiment of illegitimacy; it is the antithesis of Judaism and can not be the representative of the Jewish People. 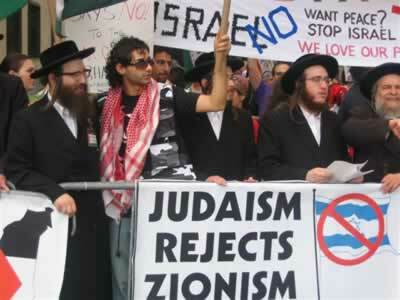 In fact, the leaders of the Jewish People, who have been and are steadfast in their commitment to the Jewish religion, have always stood in opposition to the creation and to the existence of the State of “Israel”. The Chief Rabbi of Jerusalem, Rabbi J. 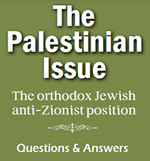 Z. Dushinsky of blessed memory, forwarded a memorandum to the Secretary General of the United Nations, in the year 1947 prior to the establishment of the State, imploring the United Nations, not to allow the creation of the so called “Jewish State”. Two horrific evils have coalesced with the confiscation of the Holy Land from the Palestinian people, and the creation of this State. Firstly, this is a rebellion against G-d who has expressly forbidden us, the Jewish people, from ending the G-dly decreed exile, by creating our own State. This is regardless if the selected country to form this state in, is populated or desolate, and regardless, if it is the will of the indigenous population to help the Jews form their State, or if the State is being forced upon them. Secondly, this rebellion against G-d has been compounded immeasurably by the fact that in order to create this state, a land has been taken, clearly against the will of the indigenous population, the Palestinian people. Their homes and properties have been confiscated and untold thousands have been expelled etc. their suffering continues unabated until the present day. Therefore, we pray, that the return of Gaza be a token beginning and should usher in the day, when we should realize the transformation of the rule over the entire Holy Land, back to its rightful rulers, - the Palestinian People. We stress, not just Gaza and the West Bank, but the entire Holy Land. Our passionate prayers are, that this should come about, speedily and peacefully, without any further bloodshed, pain or suffering. May G-d enlighten the Jewish individuals who have been led astray, to understand G-d’s will and do His Will, with happy hearts.